For the 16th time the Westphalien University of Applied Sciences took part in the National Model United Nations (NMUN) 2018 in New York. 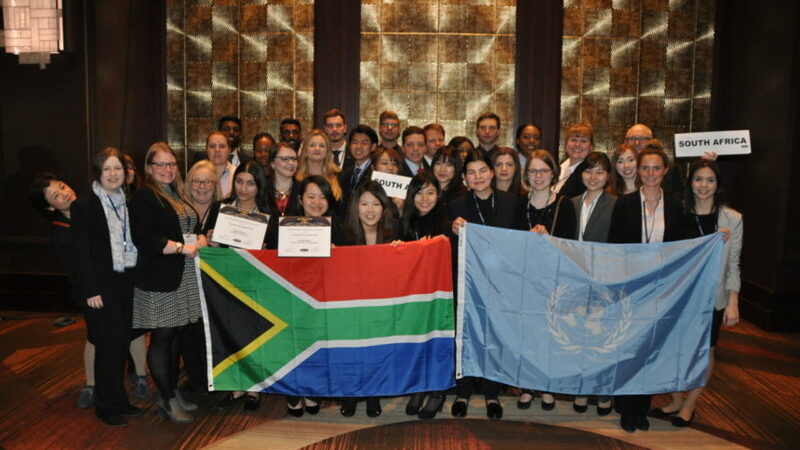 This year the students were representing the Republic of South Africa in the several UN committees. Our efforts were rewarded with an honorable mentioned delegation. Once again the students from Recklinghausen and Gelsenkirchen were working together with students from Japan. Together with the Kobe City University of Foreign Studies we participated as a joint delegation in the biggest UN simulation worldwide. After months of preperation we were in best shape to represent the interests of our assigned member state, South Africe, in the several UN committees in New York City. The negotiations were concentrating on fighting counter terrorism, establishing sustainable goals and many more topics. All delegates did a great job and were included in the work of important working papers that were all adopted as resolutions in the final voting procedure. Some delegates who enjoyed NMUN for the second or even third time, expanded their experiences by applying as chair. They got the job at the PBC, ECOSOC and the SC. The visit at the UN headquarter is every year the highlight of the conference. Due to schedule issues this year the opening ceremony was held at the place where it really happens instead of the closing ceremony. Several keynote speaker were talking about the importance of the simulation and were inspiring all delegates to do the very best during the 4 days of the conference. At the end our efforts were rewarded (once again) with an award as honorable mentioned delegation. A great archievement!